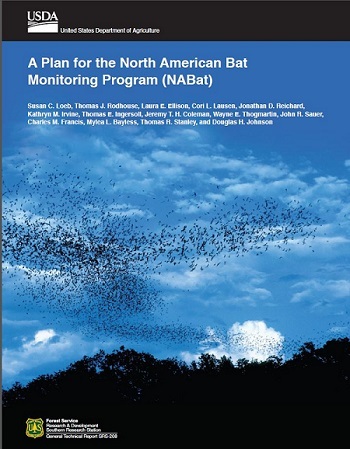 Just published online by the Forest Service Southern Research Station (SRS), A Plan for the North American Bat Monitoring Program (NABat) provides detailed guidelines for participating in NABat, an international multiagency program created to provide the data needed to make effective decisions about bat populations across the North American continent. Susan Loeb, SRS research ecologist, served as lead author on the new publication, which represents the first step in establishing the NABat monitoring program for bats in North America. North American bats face unprecedented risks from continuing and emerging threats including habitat loss and fragmentation, white-nose syndrome (WNS), wind energy development, and climate change. The fungal disease WNS has killed millions of bats since it was first detected in 2006, and well over a million bats have been killed at wind energy facilities since 2000. The continuing spread of WNS, fatalities at wind energy developments across the continent, and intensified land use changes have pressed the need for a continent-wide standardized monitoring system. “There is an urgent need to document changes in bat populations in response to multiple risks — WNS, wind energy development, climate change, and habitat loss — as well as to assess management activities aimed at mitigating these threats,” says Loeb. Acoustic surveys at stationary points. The newly published plan lays out specific guidelines for each approach, including how and when to estimate clusters of bats for population counts in caves, how to locate maternity colonies, how to collect acoustic data and identify bat species from calls recorded on detectors, how to minimize environmental impacts from monitoring, and much more. In addition to the chapters on monitoring methods, the report includes detailed chapters on the sampling design, the database management system (Bat Population Database), and statistical approaches that can be used to analyze the data collected by NABat. As data accumulates, NABat will provide statistical analyses of status and trends in bat populations at national and regional scales. Once several years of consecutive data have been collected, NABat will issue periodic “State of the Bats of North America” reports on trends in abundance and distributions of bats across North America. Periodic detailed reports focused on individual species of specific concern will also be produced.